It’s time to prepare for a Mario encrusted puzzle-based adventure as Nintendo of Europe have announced that they are to release Mario vs. Donkey Kong: Mini-Land Mayhem! across Europe within February next year. The latest entry within the long-running Mario vs. Donkey Kong series sees Mario opening his own theme park and inviting his girlfriend Pauline to enjoy the spectacle. 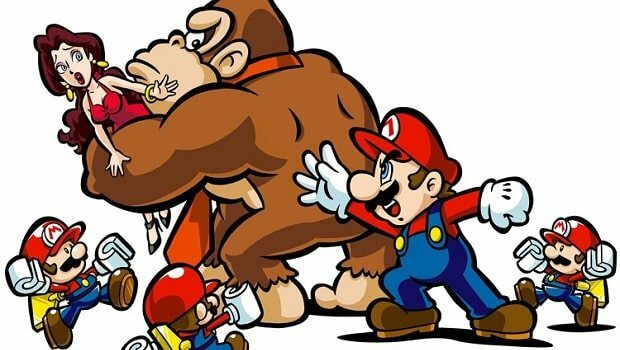 However, such a fun-filled atmosphere is soon disrupted when Donkey Kong appears to kidnap Pauline right under Mario’s nose… and moustache! You’ll therefore find yourself aiding Mario as he employs a swarm of miniature Mario toys that you must guide through levels to reach each exit door, drawing bridges, creating ladders and moving springs and blocks to ensure that they avoid all manner of hazards. All Mini Marios much reach the exit door within the time frame otherwise you will fail your task. You’ll find yourself challenged within a number of theme park inspired environments, including Teatime Trail, based upon a Teacups ride, to Cannon Cove, an area which uses cannons as a mode of transport. For those that need a little assistance in their quest to rescue Pauline, a Help Mode and a Mini Guide are available to demonstrate how to complete a stage if you are stuck. New to the series is a Challenge Mode, that provides players with the tools to create their own original levels based around templates. These are then able to be entered into official online competitions, with the winner being voted for by other players who may download such levels through the Nintendo Wi-Fi Connection. Mario vs. Donkey Kong: Mini-Land Mayhem! is due to release exclusively on Nintendo DS across Europe on 4th February 2011.